Parochial, inter-parochial, and diocesan schools in the Diocese of Baton Rouge are accredited as a District. The Diocese of Baton Rouge Catholic schools are accredited from the AdvancED Accreditation Commission. 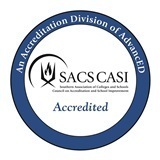 This national commission confers the Southern Association of Colleges and Schools Council for Accreditation and School Improvement (SACS/CASI) accreditation seal. The parochial, inter-parochial, and diocesan elementary and high schools were originally granted district accreditation in February of 2011 after hosting a multi-state review team in December of 2010. "The Catholic schools in the Diocese of Baton Rouge have a long tradition of excellence in education, and the accreditation process has only strengthened schools by fostering better communication and collaboration," stated Dr. Melanie Verges, Superintendent of Catholic Schools in the Diocese of Baton Rouge. The Diocese of Baton Rouge went through re-accreditation in January of 2016.